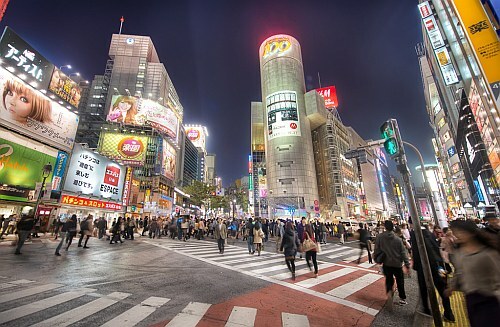 Delta has dropped the price of their flights from Calgary to Tokyo, Japan down to $688 CAD roundtrip including taxes. The flights have 1 stop in Seattle each way. The fastest flights have about a 3 hour layover each way. Update @ 11 AM MST - All Nippon Airways (ANA) has just responded to this price drop, and has dropped the price of their flights from Calgary to Tokyo down to between $591 and $633 CAD roundtrip! See details below. - Look for the dates that are $597 roundtrip. - Here are some example dates from 2019, which are harder to find. Update @ 11 AM MST - All Nippon Airways (ANA) has just responded to this price drop, and has dropped the price of their flights from Calgary to Tokyo down to between $591 and $633 CAD roundtrip! - ANA is a very good airline. - These flights fly in and out of Tokyo's HND airport, which is the one close to downtown Tokyo. calgary, yyc, flight deals, delta, tokyo, japan, nrt, asia and east asia. 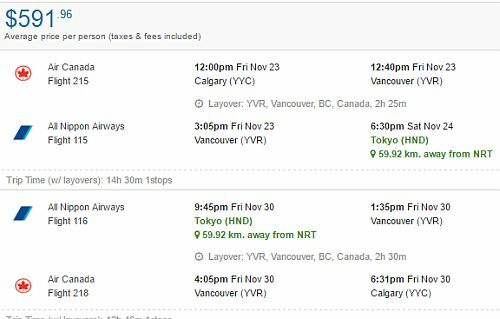 8 Responses to "Calgary to Tokyo, Japan - $591 to $688 CAD roundtrip including taxes"
Strange how the deal is only originating from Canada and one way flights are much more expensive. I just need a return flight from Japan in mid November. It's definitely not always true that the reverse flights (Foreign City to Canada) will be priced the same as Canada to Foreign City. The prices can be completely different, depending on the demand in each direction. Unfortunately the airlines price most of their one-way overseas flights about the same as their roundtrip flights. There are some exceptions, mainly to Europe (WestJet for example offers cheap one way flights to Europe). Nice one Arie! Thanks for sharing. Have a great trip. I was so excited when I saw this! My wife are taking 3 months off to go travelling to China, Japan and a bit of S.E.A. However looks like we are a couple days late to the party as flights are now closer to $1000+ PP Since we are really flexible do you have other suggestions on airports to fly into or out of that are usually cheap from Calgary? Hi Steven, there's a recent post here on YYC Deals about open jaw flights from Calgary to Singapore, returning from Beijing - for $517 roundtrip. You could try a search using dates that are 3 months apart. I just tried some January 2019 to April 2019 dates and they are coming up at $572. I looked into that however it didn't seem to work for our time frame as we are leaving sometime mid Oct and need to return by Jan 7th. We tried calling ANA to take advantage of this low round trip fees from Calgary to Tokyo, Japan, and we were quoted $5000 per person return. I understand that its been five days since you posted this deal,is there something Im missing or are we late to the show.